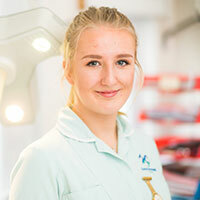 Immy is studying towards a Diploma with the Advanced Apprenticeship in Veterinary Nursing programme with Plumpton College. Immy's favourite aspect of nursing is patient care – she likes to ensure that every animal committed to her care is looked after as they would be at home, with lots of cuddles! She loves riding her horse, Tilly and also enjoys playing with her rabbit Dixie, and walking through the countryside with her three dogs Belle, Rupert and Ruffy.